On December 7, 1988, a catastrophic earthquake ripped through Armenia, decimating the town of Spitak and surrounding areas. Read about the activities of Earthquake relief from ARS chapters of Europe and Middle East. The Blue Cross of France was able to raise 19,419,719 francs ($3,233,286 USD) and receive 5 million francs ($833,333 USD) worth of equipment. Aside from its own projects (described below), the Blue Cross of France worked in conjunction with “For You Armenia” and SOS Armenie to send 2,000 tons of supplies to Armenia, and obtained a donation of ten bread ovens for Armenia worth 80,000 francs (($13,333). $1,014,308 has been allocated toward the construction of fifty homes in Amasia, as well as the construction of pharmacies in Gogaran and Stepanakert. The Regional Executive of the Blue Cross of Athens joined in the pan-community relief coalition, the “Committee for Armenian Relief of Greece.” Through the committee’s activities, nine airlifts were organized supplying to Armenia 300 tons of food, medical supplies, clothing, and hospital equipment, worth approximately $1 million. The Blue Cross of Athens also organized independently, a blood drive for earthquake casualties, and airlifted 35 tons of food and medical supplies to Armenia. Again, the Regional Executive worked within a pan-community relief committee, the Committee for Armenian Relief of Greece, and raised $100,000 in funds. One cargo plane carrying 25 tons of canned food, 7,000 winter coats, and one ton of medical supplies was sent to Armenia. Unfortunately, the authorities rejected 2,000 units of blood collected in this region’s blood drive. The ARS of London took part in the efforts of the Aid Armenia Committee, which was composed of memebers of organizations of the community. 11,000 British pounds worth of clothing went sent to Armenia. A video camera and all necessary auxiliaries were purchased for the Yerevan University. And the medical costs of a newborn child from the earthquake region were paid for. Although newly-formed, the ARS of Cyprus was capable of caring for earthquake children who came to Cyprus, in August of 1989. The Syrian Relief Cross also participated in the cooperative fundraising activities of Armenian organizations in Syria. Its members were able to collect 1 million Syrian pounds ($89,086.86 USD), the Regional Executive and chapters contributing 100,000 syrian pounds of that amount. Four cargo planes carrying 10,000,000 Syrian pounds ($890,868.60 USD ) worth of clothing, blankets, generators, food, soap, and medical supplies were sent to Armenia. Although the community of Lebanon was itself undergoing hardships at the time of the earthquake, the Lebanese Relief Cross did its best to bring its share to the relief efforts in Armenia. It was the organizer of the ARS-CE program through which 21.5 tons of medical supplies and 21 tons of food and equipment were sent to Armenia. The fundraising efforts in Amman have been on a pan-community basis. A total of 49,039 dinars ($85,348.18 USD) was collected and through the efforts of the ARS 15 tons of food, winter clothing, and blankets, and five tons of medical supplies were sent to Armenia. Through the Jordanian government, another two plane-loads of medical supplies, food, and tents were also sent to Armenia. 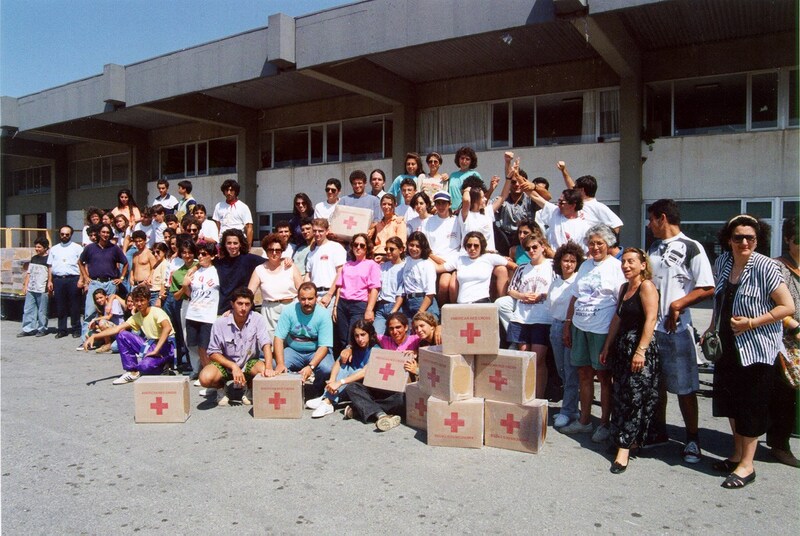 In June of 1989, sixty-one earthquake survivors were brought into Israel for medical care. Half of the survivors were housed in Jaffa, the other in Haifa. ARS members cared for and nurtured the ill Armenians in both places. And, in conjunction with the local Homenetmen, the ARS of Haifa conducted fundraising activities for the reconstruction of Armenia.